Ekiti State Governor, Mr Ayodele Fayose visited Femi Fani-Kayode at the EFCC Abuja Office today. 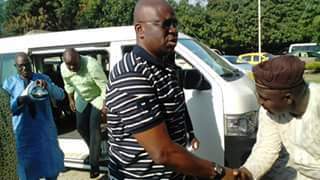 The governor arrived at the EFCC office at 2:15pm and left at 4:30pm. He was received by three operatives of the EFCC led by Mr Madaki.